The Dubai Fountain is the world’s largest dancing fountain. It sends powerful jets of water more than 500 feet (150 meters) into the air, accompanied by music and illuminated by laser projections and thousands of lights. It was designed by the creators of another world-famous fountain show, at the Bellagio hotel and casino in Las Vegas. The fountain is more than 900 feet (275 meters) long and sits on the 30-acre (12-hectare) man-made Burj Khalifa Lake in front of the Dubai Mall. Take your place to watch the aquatic spectacular on the Waterfront Promenade outside the mall. This is the most popular spot to view the fountain. A few minutes before each performance crowds of people rush out of the shopping center and the promenade gets very busy. Aim to get there early to ensure a good spot near the front. Or, book a table at one of the restaurants that overlook the lake and fountain. Another good vantage point is the bridge between the mall and Souk Al Bahar. It’s also less crowded there. Each performance lasts approximately three to five minutes. Enjoy the display as dozens of high-pressure water jets move in sync with the music. Light beams shining upward from the fountain can be seen from over 20 miles (32 kilometers) away. Stay for more than one performance. There are a number of different shows each evening and each has its own music and fountain display. Located outside Dubai Mall, the water attraction is easily accessible by bus, metro and car. The mall has more than 14,000 undercover parking spaces. The Dubai Fountain show is held every day; twice in the afternoon and every 30 minutes in the evening. Want to experience this famous attraction is an unique and memorable way? 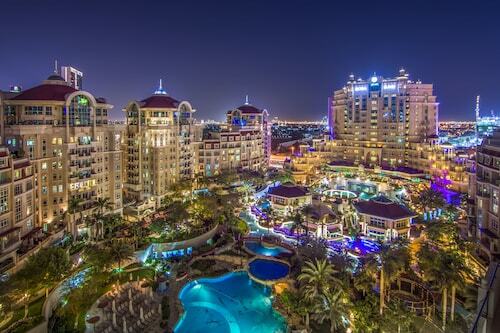 Then you can't miss a Dubai by Night Tour incl. Burj Khalifa Ticket. Have a look at our Downtown Dubai things to do page to discover even more activities while you're here. 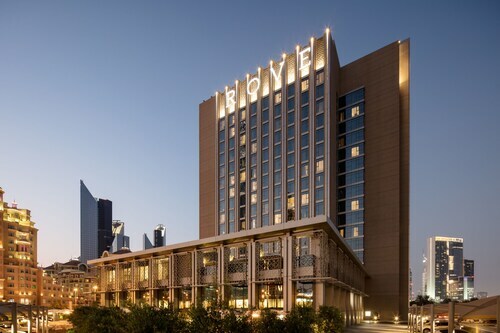 Located in Downtown Dubai, this hotel is within 1 mi (2 km) of Dubai Fountain, Dubai Mall, and Burj Khalifa. Dubai International Convention and Exhibition Centre is 3 mi (4.9 km) away. 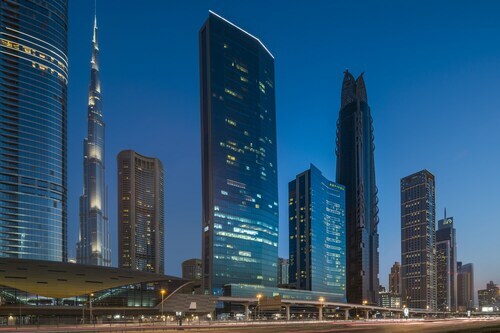 Burj Khalifa - Dubai Mall Station is 27 minutes by foot and Business Bay Station is 30 minutes.